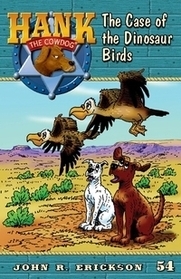 Hank the Cowdog and the Case of the Dinosaur Birds is number 54 in John R. Erickson’s long running series of short novels for children featuring the misadventures of Hank the Cowdog, Head of Ranch Security. The books are published by Erickson’s own Maverick Books, based out of his hometown of Perryton, Texas. The books are not unknown outside the area; but in the surrounding region, very few children grow up without encountering Hank and his humorous stories. The realistic depiction of life on a Texas cattle ranch as seen through the eyes of a vainglorious but not particularly bright ranch dog has also garnered many adult fans in the region. The books feature illustrations by Gerald R. Holmes. However, this review is based on the audiobook version of the story, featuring Erickson’s reading. Erickson is a talented voice actor; the story is presented more like a radio play than a straight recitation, with Erickson playing all parts: human and animal, male and female, each distinctive and memorable. Quite a few fans, and this reviewer, feel that you haven’t experienced Hank the Cowdog until you have heard one of the audiobooks. “Hank the Cowdog and the Case of the Dinosaur Birds”, by John R. Erickson. Illustrated by Gerald R. Holmes. Maverick Books Inc., 2009, paperback $4.99, CD audio book $17.99, paperback/CD combo pack $19.99, online audio $9.95. His “deputy” is another smaller, younger mutt: Drover, a white dog with a bobbed tail. Drover has a tendency to distract even Hank with his bizarre mental wanderings, but there is plenty of evidence to suggest that Drover is probably the smarter of the two. Drover is more openly cowardly than Hank, often suggesting his leg is acting up when asked to do something dangerous by Hank. The other main recurring ranch-based animal character is Pete the Barncat, who Hank dislikes (he follows the Golden Rule: Do unto others, but don’t take trash off the cats). He enjoys baiting Hank into chasing him, which usually ends with farmwife Sally May chasing Hank off with a broom. He is obviously smarter than Hank, who rarely is able to get the better of him. One other recurring character to appear in this story is the human Little Alfred, who has been approximately six and a half years old for well over a decade now. In earlier stories it was implied that all children of around his age can talk to animals; they just forget they ever had this ability as they get older. This never really comes up in this story. Two pairs of wild animals can usually be counted to show up at least once a story. The first two are Rip and Snort, a pair of coyote brothers who often are used as the mostly harmless villains, who are usually dispatched by Hank’s wits. Canids in this world are not particularly bright. Snort does the talking for the pair, while Rip is more of the strong, silent type (though he has a wonderful singing voice). They refer to themselves as cannibals, due to the fact that, though they have yet to actually go through with it, they are willing to add dog to their diet. A father and son duo of buzzards, Wallace and Junior, are missing this go around, most likely due to the similarities between them and the titular “dinosaur birds,” Freddy and Mama – a pair of pelicans trying to migrate to the Gulf of Mexico, but more than a little lost. Hank spends most of the novel believing them to be living fossils (a label the aged Mama does not appreciate) due to Little Alfred misidentifying them as “Tear-A-Dog-Tail” dinosaurs on their first appearance. The story kicks off with this first appearance of the mysterious “dinosaur birds” during the important ritual of morning scraps. Hank is so distracted by their odd appearance that Pete uses the opportunity to steal his bacon, blaming it on the “well-known” ability of Tear-A-Dog-Tail dinosaurs to employ a Bacon Beacon to steal bacon from unsuspecting dogs. Hank, not wishing to appear foolish for not knowing something so obvious, foolishly believes Pete. Eventually, he approaches the pair of pelicans, and tries to drive them from “his” ranch; at first he succeeds, but the pelicans just end up flying in a circle back to the ranch. However, Drover finally reveals to Hank the truth about the bacon theft, so when Rip and Snort threaten the newly returned pelicans, Hank comes to their rescue. Unfortunately, though these songs are often a highlight of the series, these two songs are not the best. In their defense, they are supposed to be terrible; Hank admits that he and Drover made their song up on the spot, while Rip and Snort are singing about their terrible taste in music (and just about everything, but mostly music). This is an okay chapter in a long-running series; there are much better Hank books out there. However, the series in general is worth a try, even for adults. The humor is never inappropriate for children, but it often a bit too clever for them; it’s written with parents in mind as well. God I love Hank the Cowdog. These stories are one of the reasons I became a furry.